Before winter settled in across the Alps this season I decided It was time to try out some proper warm riding pants. Similar to other moments in life where I have thought “how did I not figure that out ten years ago,” this was a positive change. I have since been riding daily in four different pairs of mountain bike pants, each with their own unique features and benefits. In the process, I convinced a couple of friends to cover their calves and ankles. A few weeks after one particularly rainy ride, one of my trail mates mentioned, “I was so jealous of you pealing your pants off along with all the mud and hopping in the car while I stood in the rain scrubbing the mud off my legs. I had to go get a pair of riding pants.” This was more a case of observational-learning than peer pressure, but I am glad we are all warmer for it. In addition to cutting the wind and mud from my lower legs, and keeping my kneepads cleaner, I dig how riding pants provide a layer of protection between me and whatever forest-detritus my front tire launches. Also, pant legs are generally thick enough to keep my pedals from making tiger scratches down my shins while practicing new skills. Given all of these benefits, I will be riding with trail-trousers until the summer months force me to choose otherwise. Below are the four pairs I tested. I wore each pair with the same IXS Flow+ kneepads to check fit, and I made sure to drag them all through the mud at least twice. I will begin with the most affordable, and quite possibly the toughest pair of trousers I tried. Developed with two seasons of feedback from DH legend Greg Minnaar, and heaps of motocross durability knowledge, the Legacy looks, feels, and is a highly technical piece of gear. There are three types of fabric used in the Legacy pants. The main material is a moisture-wicking, soft shell fabric. The seat material is a super thick duck-style fabric, and all of the seams are double or triple stitched. The third fabric, just below the waistband and around the knees is porous and stretchy. This breathable material fits well around kneepads, and allows riders to move around freely without tugging the pant-waist down. It also helps keep cool in some key areas, allowing extra airflow to your kneepads so they don’t end up a sweaty mess. Laser-cut holes on the inner thigh add further ventilation to make the ride pleasant. With two hook-and-loop adjustment straps and a stripe of silicone around the inner waistband, I did not have any trouble keeping these pants in place as I rode. 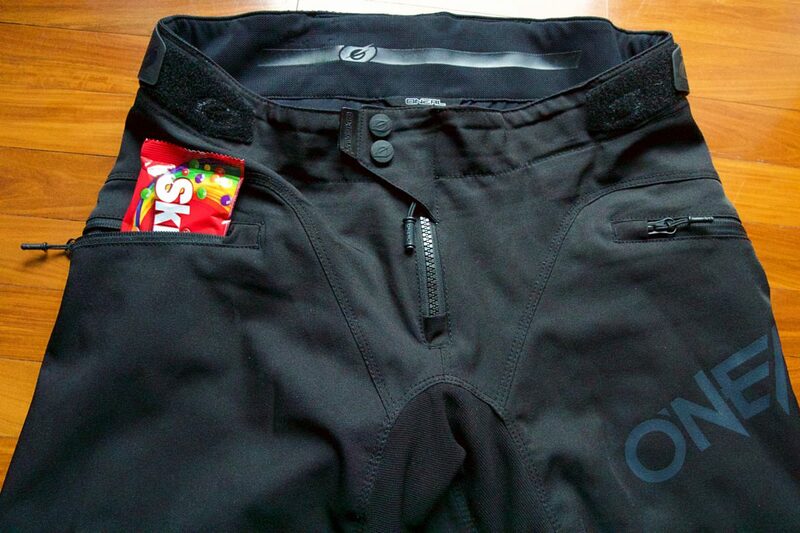 The two front pockets are convenient for snacks and a cell phone when you are on a bagless ride. Hip pockets on the Legacy pant make bagless front country riding more plausible, and will be perfect snack storage on cooler park days. These pants are fitted to keep material from flapping about and getting caught on things. With no zippers at the ankle openings, you will have to remove them in order to put on kneepads at the top of the hill. I like to use this kneepad dress-down as an excuse to stretch a little before descending. If you want pants that look and feel like legit gravity racing gear, simply find the Legacy size that fits you best. These pants are tough and ready to party. If I can manage to wear them out I will go buy the same pair again. The black panels are made of a 3-layer fabric, while the green use 2.5 layers. Now for the winter-weather wear. Based in the UK, Madison Clothing has an Olympic-level rain riding facility at their disposal, and it shows in their clothing construction. The DTE Waterproof Trousers use a breathable 2.5 layer fabric throughout, and a 3-layer fabric on the rear panel, inner thigh, knees, and drive-side ankle to add durability. Fully taped seams mean the pants are truly waterproof, and despite the story from the sunlit photo above, I did get these good and muddy. 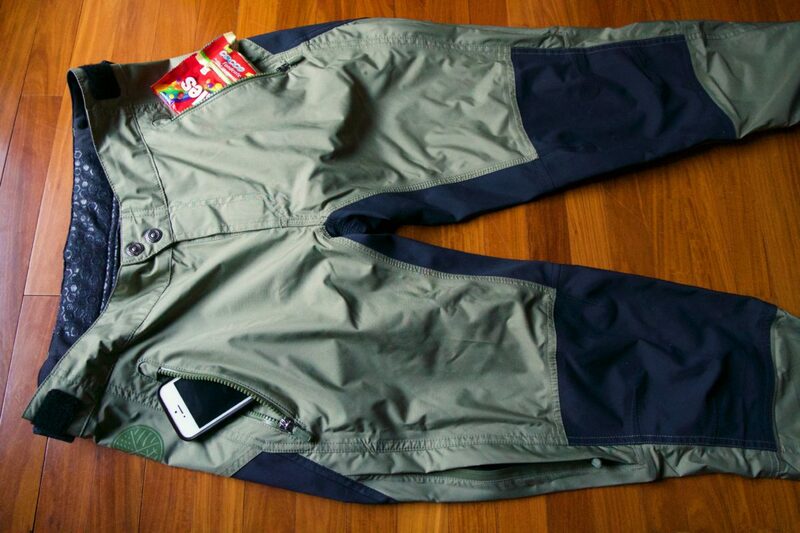 Similar to other modern rain gear, these pants move air through and perspiration out quite effectively. There are four zippers on these pants, but the waist closure uses hook-and-loop and two sturdy snaps. The zippers are used on the two large hip pockets and sealable side air vents. The DTE pants also use a silicone strap around the waistline, and adjustment straps on either side of the hips. For my chicken legs, the ankle holes are large enough to slide pads up and down as I need, by opening the adjustment straps and pulling the pant legs up over my knee. When not riding in the forest, or typing these words, I often need to run errands by bike and have enjoyed the fit of these trousers for commuting as well as shredding. They are warm, comfortable, and the fitted legs leave just enough room for a dry pair of jeans underneath. 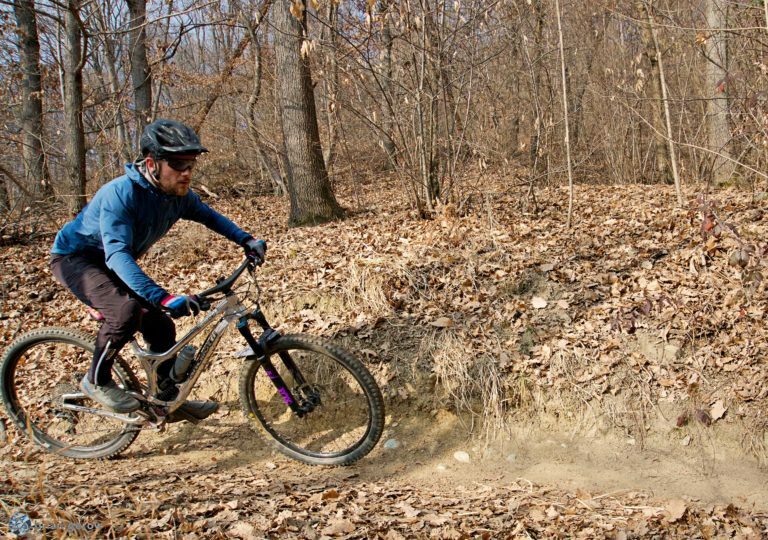 Drive side ankle protection is a feature worth considering when buying new MTB pants. The DTE Trousers from Madison Clothing are a versatile piece of gear. Their durable, waterproof construction and slightly roomier fit make them a solid pant for skiing or hiking expeditions, in addition to singletrack exploration. Fit straps on the waist, and silicone band inside the waist to keep them snug and in place. 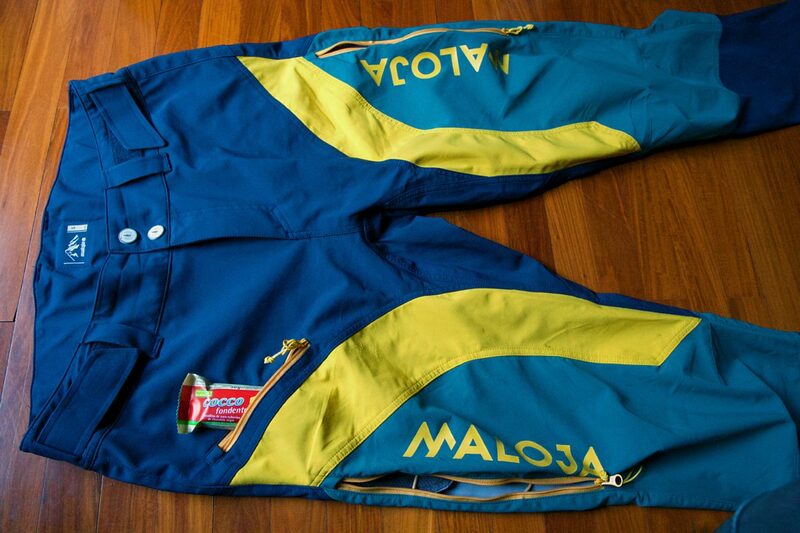 This is the pair that initially inspired me to check out mountain bike pants. 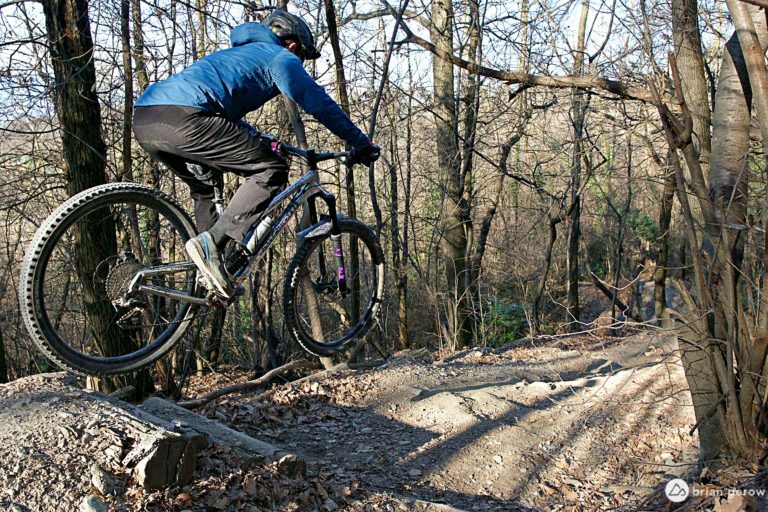 I was riding with a friend in Finale Ligure last December and was considerably colder than I wanted to be. Constantly fighting with the placement of leg warmers and kneepads, I felt like a dunce. My buddy had on a pair of ION Scrub Select pants, and I was keen to see if they would curb some of my wardrobe frustrations. They did. The Scrub Select pants are made of a soft shell fabric that stretches in all of the right places. I have been wearing these since early autumn and have never once had to deal with them falling down or shifting around. I just pull them on and go ride. The fabric is breathable enough that they don’t need thigh vents. These pants are water-resistant, though they are in no way waterproof. In a light rain, or on a muddy slide, they are perfect. When it is actively raining, water will eventually seep through the material. The cellphone pocket on the Scrub is designed to keep your phone dry, while the neoprene insert provides a little extra protection. The fit is snug, almost like skinny jeans, though I found plenty of room for larger kneepads underneath. The Scrub pants employ the usual double waist adjusters, offering ample room for a before and after lunch waistline fit. The zippered ankles make space for kneepads on the climb, and I was able to pull up my pads without removing the pants. This is a convenient benefit. The ION Scrub pants are understated and cozy. With high-tech fabric all around, they somehow look and feel more casual than the other pants in this review. The fit is so comfy, I might wear them on the couch after riding as well. Ribbed fabric inserts allow for additional flexibility around the knee. The SamadenM have a cool vintage motocross look. Like the soft shell pair above, these pants are notably comfortable. With breathable, 4-way stretch material throughout, they have been warm and pleasant for chilly winter riding. The SamadenM pants are coated with a DWR finish, making them water- and dirt-resistant and easy to clean. Partially taped seams and 3-layer fabric help cut the windchill from fast descents and formidable storms. The design team at Maloja is working to be as friendly as possible to our environment, with all of their textiles meeting Bluesign standards. 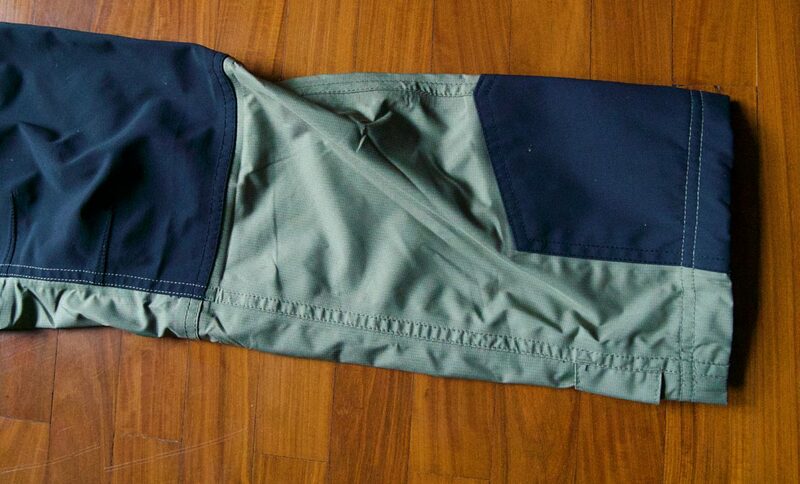 The two zippered thigh long side vents open wide, making these the most ventilated pants I tested. 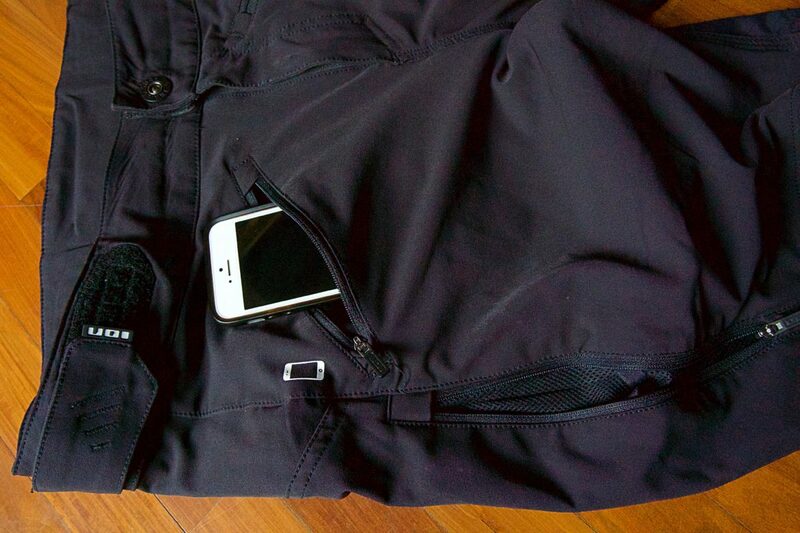 There is one front pocket, large enough for a cell phone and likely some snacks. The fit is tapered, with ample room for the same IXS Flow kneepads that I wore with all four pairs. Ankle straps allow riders to keep the pants away from the drivetrain, though I was not able to pull them over my kneepads to change pad position. The front closes with two snaps and a sturdy YKK zipper, and the waist tightens with two adjustment straps. If you prefer more solid or neutral colors, Maloja does make the SamadenM in black and dark blue. Though not 100% waterproof, the SamadenM pants are the warmest pants I tried. Their long vents make them quite versatile for shoulder season riding and cooler summer days in the mountains.